I've been playing WeiQi since the beginning of Sep 2004, but I haven't played many games since then. I tend to play go every few days for a month or so then go months without playing. As a result I'm not very strong since I tend to forget stuff in the long periods between which I play. I usually play on the KGSGoServer. Sometimes I talk to people in the CrunchyrollGoClub.  "KichiGuy" is a cross-lingual pun using the Japanese word "kichigai" and the english word "guy." For people who already did the TheInteractiveWayToGo. This is vaguely based on the sequence of stuff presented in LearnToPlayGoSeries Volumes I and II. If one jump two, if two jump three. The game of go can be rather intimidating to the new player. Even though the rules are childishly simple, the complexity of the tactics and strategy of go rivals that of practically every other game in existence. In addition, go can look rather boring to the first time player who, without much awareness of the complexity of the game, may think of it as little more than a bunch of stones being almost randomly dropped on a board one after the other. While this article is not intended to teach the game to first-time players, it is intended to give those newly interested in go a head start on both learning and appreciating this ancient game. Several points of advice are presented below. Note: Don't hesitate to reorder these if desired. Not sure exactly what order they should be in. While it's quite possible to learn to play go using online resources, the quality of the instruction from a number of books is probably superior to what you can find on most web sites. (The main exception to this is probably The Interactive Way to Go which is a great interactive introduction to the game.) Go involves concepts that are best introduced in order of increasing complexity, and good books do a good job of both explaining concepts and introducing them in the best order. When it comes to beginner books, I recommend the Learn to Play Go series of books (LearnToPlayGoSeries) by Janice Kim and Jeong Soo-hyun. These books do an excellent job of introducing important go concepts in a simple clean manner with a minimum of unnecessary verbiage. While they are based on a similar series of Korean books by Jeong Soo-hyun, Janice Kim does a good job with translation, editing, and adding new material. The books also make plentiful use of diagrams which I find especially helpful. There are reviews of Learn to Play Go volumes I through IV at David Carlton's site. The books can be purchased from Samarkand and probably other places online. Some people also recommend Go For Beginners by Iwamoto Kaoru (GoForBeginners), however I found this book to be somewhat awkward in its English translation. I much prefer the books of the Learn to Play Go series. It's my theory that some people start learning go, and before really giving it a chance they conclude that it's boring and give up on it. I personally felt somewhat like this at first. It seems like go didn't get really interesting until I had learned most of the material in the second volume of the Learn to Play Go series and gotten to where I started to understand tactics and strategy. For this reason, it's important to give yourself sufficient chance to learn the game up to a certain point. To help yourself stay motivated, you might find it useful to read about the benefits of playing go. Milt's Go Page contains a number of interesting facts on go and mental development. For example, you might find it interesting to know that "there have been no professional go players who have ever suffered from Alzheimer's." See The Pleasurable Way to a Superior Mind. Igowin from Smart Games is a free 9x9 version of The Many Faces of Go software for Microsoft Windows. I have found it very useful for rapidly developing my understanding of basic tactics, and even a little strategy, without having to find a human opponent. Igowin will start you out with a 4 stone handicap and reduce the handicap the more times you win. If you can beat Igowin without a handicap, then you're doing pretty well and probably have a decent understanding of the most basic go tactics. Playing on a full-size (19x19) board is much different though, and even though Igowin may rate you at "12 kyu" if you beat it enough times, it doesn't mean that you'll be able to beat another human who's ranked at 12 kyu by an online server or go organization. Regardless, though, Igowin provides a great free way to learn how to avoid really basic mistakes. It will ruthlessly capture your stones if you leave yourself open, and it won't even take any time to think about it. Once you can beat Igowin in an even game though, you're probably better off spending your time playing human players on a full-size board. Sensei's Library is a Wiki (web site which anyone can edit) devoted to the subject of go. It's basically a free online encyclopedia of go created by many contributors over a period of several years. SL, as it's often abbreviated, is a great resource for looking up go terms and other go concepts that you might hear people talking about. If you are a bit poor at the moment and would rather not spend money on books, you can even learn to play go from the beginner pages on the site. You'd be a fool not to check out this excellent site and refer to it frequently. Getting together with people in person to play go is usually more difficult and time consuming than playing online. As a result, playing go online will increase the number of games you get to play against real humans with a minimum of cost and effort. The main way you get better at go is by playing, so playing online means more go playing and therefore faster development of your go skills. Since we want you to get involved with The Enclave, I will only mention the best online server, the Kiseido Go Server, also known as KGS. This server uses an excellent Java-based client that should run on any operating system, and it has an excellent online community with plenty of social interaction. Playing go online is free, and a great way to play against a real human at any convenient time (there is always someone online who wants to play) without even having to own any go equipment. In addition to reading about go and playing go, solving go problems is a great way to develop your go skills. While you can buy books that contain go problems, there's also a free web site called goproblems.com which contains thousands of problems for you to solve interactively online. While solving go problems can be a form of solo go entertainment in and of itself, it also helps prepare you to spot and deal with similar situations in real games. You may find yourself noticing that a problem bears some similarity to some situation in a game you played, and while playing you might notice something that looks suspiciously like a go problem you've seen before. Playing stronger players usually means getting beaten, which may not be so great for your ego, but you're more likely to learn something this way than you are from totally destroying someone who has no idea what they're doing. Try not to get discouraged if you're losing, but instead look at what your opponent is doing to beat you. Not only can you learn something, but you'll probably find such games more interesting even if you don't win. You may also find it useful to fully play out such games, rather than resign, even if you reach a point at which you're sure you can no longer win. Even if you're new, there's probably someone even newer or less skilled. In addition to helping them learn, playing someone weaker will help remind you of your progress and provide you with somewhat of an ego boost (if you win, anyway.) If you're playing online, such as on KGS, keep in mind though that some newer users may not have an accurate rank because they haven't played enough games yet. So if you find yourself being beaten by someone of a lower rank, it could be because their rank doesn't accurately reflect their ability. If that's the case then you'll be helping them fix their rank while hopefully learning something from playing someone stronger than you. If you play on KGS, all of your games are saved on the server. Particularly if you lose a game, it's very useful to have a more experienced player review the game with you to point out where you made good moves and where you might have made better ones. The Enclave room on KGS usually has someone who will be willing to help you with this. In addition, many times if you are playing a stronger opponent, your opponent will offer (or be willing to on request) to review the game with you. The review tools provided by the KGS client make this easy. In addition to having games reviewed by people on KGS, there is also The Go Teaching Ladder, a site where you can upload your game (in the form of an SGF, Smart Go File) for a random person to review. Having some of your games reviewed is highly recommended. I have been told that you should try to have at least 1 in 5 of your games reviewed. KGS has a number of features that allow go teachers to give audio lectures and lessons online. As a beginner you may find many of the lectures a bit beyond your current understanding of the game, but there are some lectures oriented toward beginners. Join the room "The Enclave" (under Social) on KGS and check out the schedule to see what lectures are coming up. Usually these lectures are free to attend, but some of the teachers do charge a fee for them which has to be paid by someone. Make sure to inquire about whether a lecture has a cost associated with it and how you can donate (if you can afford to do so). Sometimes it's nice to get out of the house and out from in front of a computer screen. Joining a local go club can be a good way to accomplish this. In the United States you might want to check out the American Go Association web site to see if there's an AGA chapter local to you. In Europe check out the European Go Federation. For other locations, you might want to refer to the Go Places page on Sensei's Library. Go is believed to be at least 2,000 years old, and possibly as old, or maybe older than, 4,000 years old. Though it may not help you play better, reading about the history of go can give you a deeper appreciation for the game. Hopefully at this point you should have a decent start towards learning the game of go, and a good sense of what online resources are available. Make sure to stop by The Enclave room on KGS if you have any questions or just want to say hi.